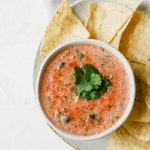 The BEST Easy Salsa Recipe made with fresh tomatoes, jalapeño, and cilantro. Delicious and perfect as a healthy, homemade snack! Guys, we’re talking SALSA today! And being from Texas, this is definitely hitting home. I loooooooooove salsa! Well, more specifically, chips and salsa. But also salsa on tacos (like these Easy Mexican Barbacoa Tacos), fajitas (hello, Healthy Chicken Fajita Tacos and Chicken Fajita Casserole), and many other recipes. It’s just a great thing to have around! How do you make the best salsa ever? To make the best easy salsa recipe, you’ll need high quality ingredients and a good blender! Plum tomatoes, lime juice, crushed red pepper, cayenne, garlic powder, onion flakes (or fresh onion), cilantro, and a jalapeño or serrano pepper make the best homemade salsa. How long will homemade salsa last? Homemade salsa lasts about 5-6 days in the refrigerator. Store it in a mason jar with a lid or an airtight container to keep it fresh! I used a jalapeño for this recipe. However, feel free to use a serrano pepper if desired! Do you put jalapeño seeds in salsa? Keeping the jalapeño seeds in the salsa can make it more spicy. If you want a salsa recipe that’s less spicy, remove the jalapeño seeds! What can I substitute for jalapeños in salsa? Jalapeños make for a great, medium spicy salsa! However, feel free to substitute the jalapeño in salsa with banana peppers or diced green chile peppers for a milder salsa. You can also substitute the jalapeño with serrano peppers if you’re looking to create a hotter salsa! Cut the jalapeño (I recommend using gloves!) and remove the seeds (if desired). Place everything in the blender (except for the cilantro) and blend to desired consistency. Slowly add in the cilantro and blend, adjusting to desired consistency and taste. SO delicious! Love this salsa recipe with tortilla chips. Will definitely make it again!